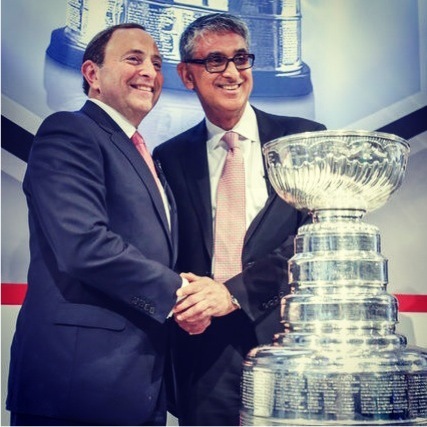 Nadir Mohamed, President and CEO, of Rogers Communication made a groundbreaking deal with Gary Bettman of the NHL for National Broadcasting Rights in Canada. Hockeyland Canada discussed the deal here Breaking Down The Landmark NHL/Rogers TV Deal. Ron Maclean on the first Hockey Night in Canada since the deal profiled Nadir Mohamed and Ismailis in Canada, including Calgary Mayor Naheed Nenshi and HNIC Senior Producer Sherali Najak. Ron Maclean details Nadir Mohamed’s background as an Ismaili Muslim Canadian and Gary Bettman’s background as a Jewish American, as Ron comments “it’s cool that the Jewish Gary Bettman and Ismaili Muslim Nadir Mohamed sign a $5 billion dollar deal that helps to continue that little community growing larger to share that connection we have” with HNIC which is a huge part of Canada. This news has now travelled all over the net, FWd by 100s of Ismailis and East African Asians in general. In the below you’ll find pages from my book “Uganda Asians” on that whole connection among the Golden Goal, the Aga Khan and Sherali Najak. My book will be launched, God willing, in March 2014, at 1666 pages. It’s necessary to give the year since I missed many March deadlines in the 6.8 years I have been writing the book. It’s the story in people’s own words (a kind of a community autobiography) of Uganda Asians from the start of the colonial project to the 1972 expulsion and from 1972 to the present. A major section is given to how people coped the three months expulsion deadline, 100 people who never left Uganda for even a day and 1000s of people who ended up in UNHCR refugee centres. How Uganda fared after the expulsion and how the expellees fared in the diaspora countries is part of the story, as also the two thousand or so original Uganda Asians who have returned to Uganda since the fall of the dictator Idi Amin in 1979. The book makes a connect between Uganda (and other East African) Asians’ successful resettlement in Canada and the adoption of the Multiculralism Law by Canada in July 1988. Pierre Elliot Trudeau, H H the Aga Khan and Prince Sadruddin Aga Khan (UNHCR) are the standout heroes of the book – apart from the whole Uganda Asian people! The Aga Khan and his uncle are thanked by even non-Ismailis who were rescued out of Uganda in those ninety days. How did the Uganda economy fare and how did the expellees fare? The GDP collapsed by 40% on the Asians’ departure. The expellees fared so well in the diaspora countries – UK (30k intake), Canada (7k), USA (1.5k) – that the wealth of the top 50 of them would equal 1/3rd of Uganda’s current GDP (US$ 20 billion). A million-words book for just low-thousand readers? There are at the most 7k pre-1972 Uganda Asian households in the world today. If half of them buy the book it would be a blockbuster on the proportionate scale. It was a book that had to be written, otherwise that history from 1880 would be lost forever. I just hope it’s noticed in the media!